High school research student Tristan Tran has been accepted to participate in the Feinstein Institute summer student intern program. The junior will work with Dr. Daniel Grande on disease-oriented research. The Feinstein Institute internship program is designed to provide high school, college and graduate students with hands-on experience in disease-oriented research and familiarize them with opportunities that exist for careers in medical research. Guided by teacher Nicole Cagno-Angerame, members of the Number Crunchers math club at Oquenock recently designed their own tessellations. Tessellations are a collection of shapes that fit together like puzzle pieces. The tiling of the shape covers an infinite mathematical plane without any gaps. Inspired by the work of M.C. Escher as well as tessellations in nature such as pinecones, pineapples and sunflowers, the students learned to use one or more of three basic operations: translation, rotation and reflection. The high school’s girls golf team experienced two hole-in-ones at Sumpwams Creek Golf Course to start the season. Senior Marion Wegener scored a hole-in-one from 128 yards on Hole 5, while freshman Ava Maresca scored a hole-in-one from 91 yards on Hole 4. The high school Mock Trial team recently earned their way into the Suffolk County playoffs, ranking seventh out of 26 teams in the county. It was was the first time the team has qualified for the postseason. In the first playoff round, the team defeated Smithtown West during their trial in the Suffolk County District Courthouse in Central Islip, earning praise from the presiding judge for their preparation and presentation as attorneys and witnesses. High school senior Lauren Leonardi was selected as the sole participant in the National Association for Music Education’s All-Eastern Honors Treble Chorus. Leonardi, who plans to pursue a degree in musical theater in the fall, will travel to Pittsburgh in April to perform with the most talented student-musicians in the eastern United States. 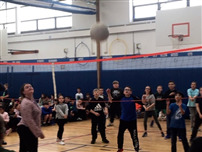 Bellew fifth graders recently teamed up against members of the staff for a friendly game of volleyball. The gymnasium was exploding with excitement as the ball was volleyed back and forth. Certificates were given out to all students who participated in the event, which was coordinated by Bellew’s physical education teachers. Fourth graders at Oquenock recently constructed working lighthouses to culminate their unit on electricity. Each student began by plastering and painting a tube to look like a lighthouse. Using their knowledge of circuits, the students were able to wire their lighthouses with batteries, switches and bulbs. They finalized the projects by decorating them with shells, small houses and sand. Click here for dates and times of this year's Summer Camps. Individual camp fliers are coming soon! Eight junior and senior artists – Anjolie Falbo, Brianna Faust, Sophia Gutierrez, Valeria Medina, Paisley Narra, Matthew Rittenhouse, Jake Siffert and Krista Wolfe – from the high school were selected to submit their original artwork for the 23rd annual “Long Island’s Best: Young Artists at the Heckscher Museum” competition. More than 60 high schools from across Nassau and Suffolk counties participate in the show, held at the Heckscher Museum in Huntington and displayed from April 6 through May 19. Sixth-graders in Kristin Grossi's and Theresa Robertson’s math classes at Beach Street recently worked on “geometry cities.” Students were given a blank map with instructions such as “make two streets parallel” and “draw a hospital that is a rhombus and place it on a ray.” They were tasked with completing the map while following the specifications. The map had to have a theme, and street and store names had to be labeled according to the theme. The students then enjoyed decorating their maps and making them colorful. The high school’s Thirst Project hosted an open house and family night at the high school on March 6. The club’s co-presidents, seniors Douglas Dillman and Jennifer Nieves, invited Evan Wesley, the Thirst Project’s vice president of student activation, to give a presentation regarding the global water crisis. Attendees learned about the importance of water security and how all aspects of community sustainability rely on clean water. In addition to Wesley’s lecture, club members prepared three interactive display stations – “water availability,” “walking for water” and “waterborne diseases” – to provide detailed information about the difficulties of a life without clean water. Parents viewed a model of what contaminated water looks like, and had the opportunity to try to carry a five-gallon jerrycan weighing 44 pounds, which replicated the daily struggle of women and young children in the developing world to access water. “West Islip is the gold standard of Thirst Project clubs worldwide and has carried on a legacy of student activism and community involvement within the charity organization,” said Wesley. The evening also included several raffles. Alumna Vicky Labetti won two free tickets to West Islip Thirst Project’s upcoming third annual gala, while senior Matthew Rittenhouse went home with assorted chocolates. Kindergartners in Mary Berger and Pamela Hergerton’s class at Oquenock recently designed sails for cars as part of a science unit on movement. Each student’s goal was to design a sail to put on a car to make it move the farthest and fastest. The students had to consider what size sail to make and how tall the straw that held it should be to get the best results. In the subsequent experiment, the students raced two cars at a time – moved by breath and a blow dryer – and recorded the results, concluding that shorter straws with larger sails moved the farthest and the fastest. Third-graders at Bellew recently visited the birthplace of one of America’s greatest poets, Walt Whitman. During their tour of this New York State Historic Site, a newly restored farmhouse built circa 1819 by Whitman’s father, students examined 19th-century furniture, including an old schoolmaster’s desk, and experienced what life was like when Walt Whitman grew up on Long Island. 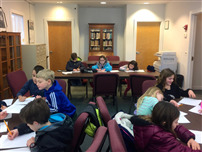 They also learned about Whitman’s poetry techniques and had the opportunity to become writers themselves. “The excitement was definitely felt as students read poems they wrote about their favorite animals, using a technique learned at the Whitman birthplace,” said Principal Rhonda Pratt. 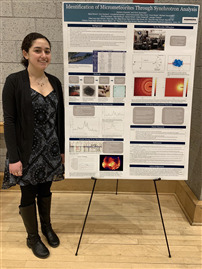 High school senior Madison Esposito and research partner Kevin Souhrada from Bay Shore High School won Grand Award Second Place in the chemistry category at the Long Island Science and Engineering Fair, as well as a 2019 Taking the Pulse of the Planet award from the National Oceanic and Atmospheric Administration. Another West Islip high schooler, Jake Maresca, was recognized with an award from the U.S. Metric Association for his research on prosthetic hands. 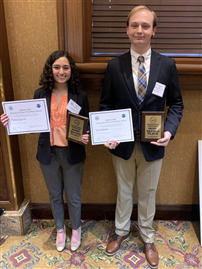 At LISEF’s junior varsity competition, the team of Rachel Denzler and Michael Pleitez won third place in the behavioral science category, while Max Hujik won honorable mention in environmental science. 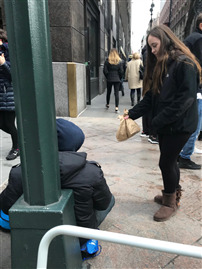 This winter, the annual Peanut Butter and Jelly Gang community service act by the high school’s Students with HEARTT exceeded previous years, with 17 students making, bagging and handing out more than 765 peanut butter and jelly sandwich lunches for New York City’s homeless. 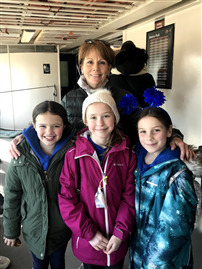 The altruistic students were assisted by several parents and faculty members, HEARTT founder Virginia Scudder, and members of the LI Ninjitsu Center. The Atlantic Auto Mall in West Islip hosted the participants for the food preparation. 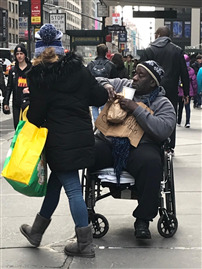 “This eye-opening experience is not only rewarding and gratifying, it provided the students a moment to shine light on our need to help others,” said Scudder. The symposium celebrated the accomplishments of women in science, technology, engineering and math fields. Lecturers and panelists discussed the impact of women in STEM careers, women in the work environment, impacts on the economy, and how society can improve female participation in STEM fields. 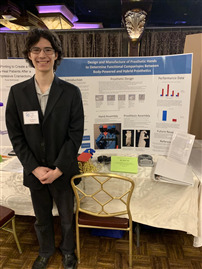 Esposito and micrometeorite team partner Kevin Souhrada of Bay Shore High School previously presented their research in the Junior Science and Humanities Symposium’s 2018 Long Island regional semifinals, held on Feb. 3 at York College in Queens. 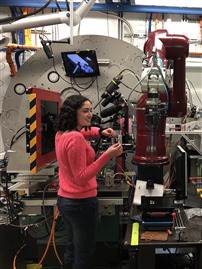 The two students have been experimenting at the National Synchrotron Light Source II, the brightest X-ray microscope in the world, located at Brookhaven National Laboratory. The research team has been using various beamlines to uncover the chemistry and mineralogy of micrometeorites collected from high school roofs across Long Island, including samples the students collected from their very own schools. Their work is part of BNL’s Student Partnerships for Advanced Research and Knowledge program in which students and teachers work together with Brookhaven scientists to conduct experiments at the lab’s state-of-the-art facilities. West Islip’s seniors now have a special space to eat lunch, the Bistro Café, replete with exciting new meal options. Previously called “Cafeteria C,” it was once a lunch spot for freshmen. Plans for the impressive renovation – a collaborative effort between the district’s buildings and grounds and food service departments – were set in motion a year ago, with the upgrade of the space completed in February. Available for use solely by seniors, the Bistro Café offers a dining experience that is more consistent with the fast-casual restaurant environments that today’s students are accustomed to. New high-top tables and booth seating options create a social and relaxing atmosphere for the seniors. A grab-and-go food stand was also built to offer them fresh, healthy meals on the go, with fewer lines and shorter wait times. The “Bistro Box” lunch delivers a well-balanced meal that includes a full cup or more of fresh vegetables and fruit. Other choices include a variety of fresh sandwiches and salads as well as less traditional lunches such as the “Yogurt Parfait Bistro Box,” featuring yogurt, granola and strawberries, and the “Vegetarian Snacks Bistro Box,” offering string cheese and pretzels with hummus. The high school’s varsity girls basketball team recently completed another excellent season. Under the guidance of head coach Chris Scharf and assistant coach Jeremy Robertson, the Lady Lions finished with a 16-5 record and hosted a Section XI home playoff game for the first time in many years. “This team had a competitive and positive attitude and tremendous success, which younger players will aspire to replicate for years to come,” said Athletic Director Tim Horan. Research classes from Udall visited the high school research lab on Feb. 26 to learn what high school research projects are all about. First, the younger scientists worked alongside high school research students to conduct a DNA extraction lab experiment, guided by teacher Mary Kroll. The high school students then shared poster presentations from their own research projects with the middle schoolers. Wrestling coach Nick LaGiglia recently celebrated his 100th varsity win, a 45-39 victory over Huntington. LaGiglia, a Class of 1994 West Islip graduate and social studies teacher at the high school, has led the Lions to many victories over the years. Bellew held its third annual science fair on March 4, showcasing terrific projects from more than 150 participating students from kindergarten through fifth grade. Students shared their findings on topics including the solar system, electricity, simple machines, buoyancy, plants and the amount of sugar in our daily diet. 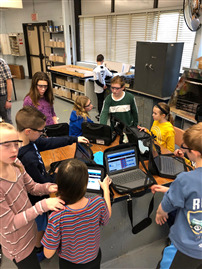 “I was truly impressed with the questions they researched, the data collected and their genuine excitement about the STEM field,” said Principal Rhonda Pratt. 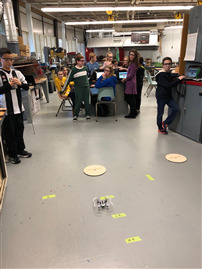 Using their Chromebooks, sixth-graders in Thomas Larsen’s coding class at Beach Street recently programmed quad copters to take off, navigate and land at specific locations. For the second consecutive year, criminal justice and college and business law classes at the high school were visited by representatives from the U.S. Department of Homeland Security and its canine unit. The presentation, held in the school’s auditorium, included discussion of the officers’ career requirements, job description and duties, their operations at our local and international airports, and the use of trained dogs in the canine unit. “The students were extremely engaged and inquisitive, and the presentation was a success,” said teacher Shawn Wallace, who organized the event. Kindergartners and fifth-graders at Bellew recently paired up in buddy classes to create “snowflakes” in the STEM lab. Students learned why snow is white and used glue and wax paper to make the snowflakes, providing practice in cutting and tracing. Members of the high school’s Future Business Leaders of America club, moderated by Monica Krawczyk and Joanne Macrelli, recently visited introductory and advanced computing classes at the district’s Beach Street and Udall Road middle schools to put their leadership skills to practical use. Students Nickole Aponte, Anthony Cairo, Matt Cairo, Kyle Dragelin, Gianna Fiorvanti, Catherine Fregosi, Ava Gmelch, Catie Lang, Francesca Lent, Delaney O’Shea, Evan Raible and Holly Schweitzer spoke to Beach Street students about the benefits of taking business education courses in high school, while Julianna Budriss, Aidan Kelly, Brian Kilkelly, Valeria Medina, Joseph Montiglio, Sarah Olenik, Paul Peragine, Anthony Riviezzo, Frank Riviezzo, Edward Smith, and Tobias Wefering talked to classes at Udall. After their presentations, the high schoolers networked with the younger students, learning about the latter’s career goals and what career paths they would like to pursue. The visits provided the high school students with a stronger awareness of student needs and confidence in their own abilities as speakers and presenters. 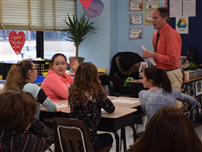 Jeanette Merola and Janet Renganeschi’s sixth-grade class at Udall was recently chosen as a Kidsday Class of the Week, and were visited by “Newsday” representative Patrick Mullooly to prepare. Participating in this children’s journalism program, the Udall students have been eagerly creating, researching and developing articles for publication at the end of July. With the use of student Chromebooks, they are implementing Google Docs to share information with each other, collaborating on ideas and receiving feedback from their teachers prior to submitting their articles. “This is an exciting opportunity for the students to showcase their writing and research skills,” said Renganeschi. High school diver Adriane Casey earned third place in the Suffolk County diving championship held at Hauppauge High School on Feb. 7. The senior’s performance in the 11-dive event grew stronger as the competition progressed, leading to her finish as the third best diver in the county. 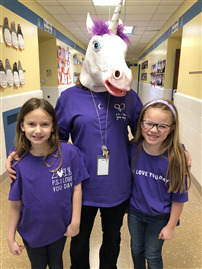 Students and staff at Bellew participated in P.S. I Love You Day on Feb. 8 by recognizing people and moments that they hold dear. Members of the school’s Happiness Project Club created large purple hearts and every student had the opportunity to “post” a message of love. Several classes visited other students and shared a high five by passing out a positive message on a popsicle stick. 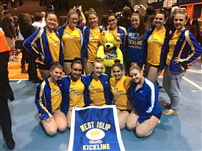 The high school’s varsity kickline team finished in an impressive fifth place overall in the Team Performance division at the Scholastic Kickline Championships, held on Feb. 3 at Nassau Community College. The team, led by captains Farrah Naja and Jillian Rudolph, and coached by Jessica Cichy, also put on a strong performance at the Stephanie Belli Festival. 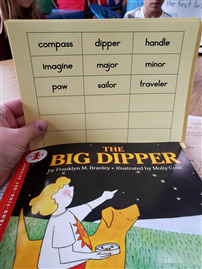 Second-graders at Bellew recently explored astronomy via Franklyn Branley’s “The Big Dipper,” the story of a girl who can point out different constellations. Guided by teacher Paul Pekurney, the students examined this informational narrative, learning about the two Dippers and how they have been used historically for navigation. The reading activity coincided with a trip to West Islip High School’s planetarium, where the children learned about the phases of the moon and the constellations. The high school’s varsity cheerleading squad won the school’s first-ever county championship on Feb. 16 at Centereach High School. Coached by Dina Barone and Steffanie Flinter, the cheer team was led by senior captains Adrianna Cigliano, Samantha DiJennaro, Olivia Gmelch, Isabella Isolano, Genna Johnson and Katie Penny. 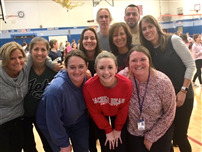 The team’s hard work and dedication earned them a first-place finish in the Division 1 medium classification competition held Jan. 26 at Sachem North High School, followed by another first-place trophy at a Feb. 2 competition at Hauppauge High School. West Islip’s overall achievement clinched them the second seed in the Section XI county championship. A total of 36 students from the high school’s Marketing Club, accompanied by chapter adviser Diana Saadat and chaperones Jennifer Delaney and Dawn Morgan, participated in DECA’s Suffolk County Regional Competition, with 17 earning medals. The event, held in Selden on Jan. 3, featured more than 1,300 students from 34 county schools. Isabella D’Avanzo and James Sladky earned a first-place trophy in the Marketing Management Team category. Additional West Islip trophy winners included Julianna Budriss in Business Services Marketing; Jake Buonocore, Courtney Metzger and Joe Montiglio in Accounting Applications; Matthew Cairo in Human Resources Management; Olivia DiStefano in Principles in Marketing; Kayla Dixon and Lily Gilmore in Buying and Merchandising Team; Kendalyn Grunenberg in Retail Merchandising; Brian Kilkelly in Sports and Entertainment Marketing; Catherine Lang in Business Finance; Maya Marino and Paisley Narra in Hotel and Lodging Management; Paul Peragine in Business Management and Administration; and Samantha Soevyn in Quick Serve Restaurant Management. The winning students will advance to compete against more than 4,000 DECA members from statewide high schools at the 58th annual DECA New York State Career Conference, to be held March 5-8 at the Riverside Convention Center in Rochester. West Islip students who were awarded honorable mention in their DECA regional events were Kyle Dragelin in Marketing Communications, Noelle Fallon and Hayley Dreyer in Travel and Tourism Team, Hannah Ferrugiari and Katie Ryan in Hospitality Services Team, and Lucas Ryan and Peyton Ryan in Sports and Entertainment Marketing Team. Other participating West Islip DECA students included Nicole Aponte, Jillian Brickman, Ty Carpinello, Michael Ciccarelli, Gianna Fioravanti, Aidan Kelly, Delaney O’Shea, Alessandra Questel, Erin Spence and Patrick Sullivan. Visiting Suffolk County Water Authority representatives recently spoke to third-graders at Oquenock about the water cycle and water conservation. The students learned that all of Long Island’s fresh groundwater comes from deep aquifers, and that pollution has long-term effects on the area’s water. Kevin Halloran, a fourth-grader at Bellew, won the school’s National Geography Bee. Fifth-graders Nico Acosta and Marley Grover finished second and third, respectively. A total of eighteen Bellew students from the Geography Explorers Club participated in the competition. As champion, Halloran will advance to the next level by taking a qualifying test to determine state competitors. If he qualifies, he will earn a seat at the New York State competition in Albany. The final competition will be held in May in Washington, DC, where students compete for college scholarships. 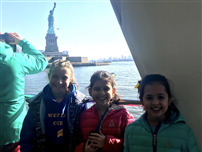 “A great job to all of our student participants who went above and beyond in their quest to learn more about the wonderful world in which we live,” said Principal Rhonda Pratt.